Thursday was a sunny day. I baked dog cookies using peanut butter, pumpkin, flour and eggs. 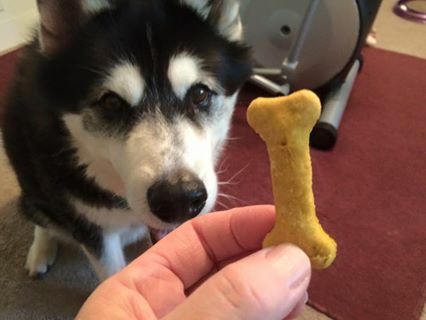 Rumpy loved them and I love that even my dog can also enjoy the fall flavor blitz. 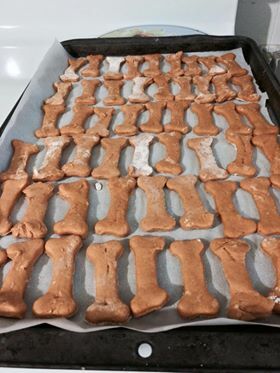 Peanut butter, pumpkin, flour and eggs make these treats a festive fall canine taste sensation! I went shopping and bought myself some new clothes. You see, I made this list of things that I want and need, and I’m making a conscious effort to get those things for myself. I now have a wardrobe for when I land that new job. After complaining for a year about AT&T’s internet service, my contract is up and I have signed up with Wow. They come out today to connect their service. President Obama talked about how we have become numb to mass shootings. I know I have. I can honestly say I feel nothing. Oh, don’t get me wrong. I am sorry for those families whose children were harmed or killed. I am sad that yet again our emergency response personnel had to respond to a scene of carnage that was absolutely preventable. I find it poetic justice that Sheriff Hanlin, who wrote a letter opposing gun control legislation after Sandy Hook, is facing first-hand the consequences of his choice. But, other than that, I feel nothing. No anger. No hurt. No frustration. While the Umpqua Community College shooting was the latest event, it won’t be the last. Like our president said, our inaction is a choice. As long as we are a nation with an idiotic obsession with guns, people will die, so we may as well get used to it. I know I did. Now, where was I? Oh yeah, I washed my car yesterday and cleaned it out. Funny how good it feels to drive around in a clean car. « It’s World Rabies Day! The worst part is I feel fake when I say I’m sorry for the families, because I don’t even feel that. I don’t feel anything. Sadly, I feel the same numbness. It seems as if we can no longer even get up the anger to raise a stink anymore. We have just come to accept the fact that the gun lobby and extremists have won. We are resigned to the fact that we will see another shooting, and another, and another. Sigh. On the bright side, an excess in the number of guns in this country will likely reduce the population, which will have only a positive effect on our climate. Very sad, we wonder what that Sheriff is considering now? But at least Rumpy has some tasty treats! That makes us happy. I’m sure he’s clinging to the NRA narrative that we need yet more guns, not less, to end this type of terrorism. Agreed. I had similar thoughts as well. Funny how we’re so afraid of immigrants and Muslims and will go to insane lengths to keep them out, but we’re not lifting a finger to address home-grown terrorism. Hard to click “like” for the shooting stuff but as for the cookies and clean car, that I like. It is funny but it does feel good when our stuff (car, home, etc.) is clean. Glad you got some new clothes and internet service. Now fingers crossed on that new job. Have a good weekend. Now 15+ Years later – those attempted robbers in the first link are out of prison…and I see them in passing in a town with no roads in or out called Juneau Alaska…So I carry a gun with me everyplace I go, because I want to live, and I want to protect the ones I love and willing to die trying to protect any other innocent folks anyone ever tries to hurt. But please, just cause I share this with you all – I do not condone people shooting people unless its in self defense of life or property. Sadly, that is my reality thru my life’s experiences. But if I did not own a gun I would not be typing here, 3 times dead. If you’d died, then in the words of Jeb Bush, stuff happens. Jeb Bush is Sarah Palin without the Bra. I will just touch on the cookies, they look delicious and I know Rumpy and you will love them. Good job on the clean car with my two Newfs my car is seldom clean. We always wonder why American law let people have guns…at least once or twice a year, we hear these sad shooting news happened at colleges…..
Oh! Those cookies look yum!!! I’m glad to see Rumpy’s happy face with them!!! If our country ever decides to address gun violence, it will be because of a mass shooting. Sadly, these horrific mass deaths are a small fraction of our country’s annual gun deaths. The majority of gun deaths are suicides. And then there are gun homicides every day that never make the national news. As for Mr. Peterson, my husband and I also have been a victim of several property crimes, sometimes by armed people and sometimes not. I’ve never owned a gun and never felt the need for one. I’ve never felt it was worth protecting any property at the risk of escalating violence or committing violence toward someone else. As I read the words of people who feel the need to sleep with a gun close at hand, I realize how frightened they are of everything. And the assailants in mass shootings also express lots of fear. Perhaps the solution to gun violence is Prozac in the drinking water. Better yet, throwing their TVs out the window, because that is where they learn there is much to be fearful of.